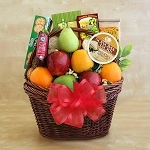 Are you looking for a perfect gift basket that doesn't contain candies or other sweets? 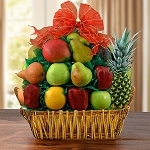 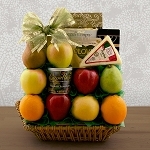 The answer is simple; give that special someone a fabulous Fresh Fruit Basket from GiftProse! 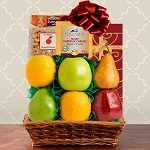 Our selection of fruit gift baskets are overflowing with the freshest apples, oranges, pears and other exotic fruit, all from local orchards so they always arrive as fresh as they were when they were picked from the tree. 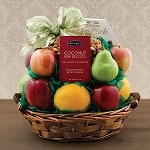 Choose from a wide array of fabulous fruit combinations with other little goodies included, like champagne, sparkling cider, gourmet cheeses and so much more. 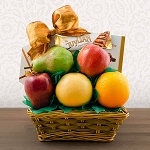 We even carry a collection of organic fruit baskets like the Life's Simple Pleasures basket, filled to the brim with organically grown fruit and some delightful spa products. 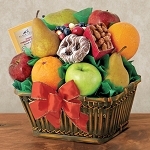 Healthy and delicious, our fresh fruit baskets show that sincere sentimentality is just part of your nature!